Drum roll please... I've chosen my 2013 Reading Challenges! I really pushed it to the last minute this time but I finally came up with a group of challenges that I'm happy with. I ended up very happy with my 2012 book challenges and really learned from my huge 2011 book challenge fail. 1. Challenges can put a lot o pressure on me if I let them. 2. Challenges can get me out of a reading funk. 3. If I push myself, challenges can be exciting. 4. Audiobooks really help with challenge completion. So let's talk about 2013 challenges. 1. First up I've got the Goodreads challenge. I love this challenge because it keeps up with the books I read each year. It also helps at the end of the year when it is time to do "Best of..." posts. I can look back through the year to see what I read. This year I did well with this challenge, completing 104 books. My goal was set for 75. This year, I'm raising my goal to 85. I'm not quite ready to set my goal at 100 because I face another year of uncertainty when it comes to my schedule. So 85 to play it safe. 2. Audiobooks Challenge (hosted by Teresa's Reading Corner). I should have participated in this challenge this year. I listened to 26 books on audio this year (if that's impressive, you should see the miles I put on my car). I'm going for a similar number this year. I've chosen the Lover level, which calls for 25 audios. 3. Sequel Challenge (hosted by Auntie Spinelli Reads). You can set your own goals with this challenge and I have high aspirations. I've chosen to shoot for 20 sequels. This sounds like quite a bit, but I have tons of sequels on deck this year AND it will go hand in hand with my plans for another challenge. 4. 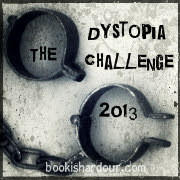 Dystopia Challenge (hosted by Bookish Ardour). I completed the Contagion level (15 books) this year and had a blast. BUT I'm leery of completing another 15 dystopian reads. Ehhh... I don't want to ruin a good experience. The next lowest level is 5 books so that's what I'm going for. 5. 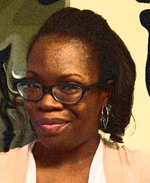 Romantic Suspense Challenge (hosted by The Book Vixen). I've got big plans for this particular challenge. This challenge calls for reading 13 romantic suspense books in 2013. My plan is that all 13 of these books come from the In Death series by J.D. Robb. This way I don't feel guilty for reading this series when I should be doing other things. Plus this would also cross over into the sequel challenge. See. I have a plan. 6. TBR Pile Challenge (hosted by 6 hosts, including Bookish). Last but certainly not least, I've got to continue to do something about my TBR pile. I loved this challenge this year but I wasn't planning on joining again because there were so many hosts and I couldn't keep up with anything about this challenge. But this year there appear to be only 6 hosts so I think I might be able to figure that out. I will again shoot for the level called A Firm Handshake which calls for reading 10 books from my TBR. I really should go higher because I purchased at least 10 books (probably more) in these last couple of weeks. But...well... I'm not going to go higher because I'm just like that. While I've picked up a few more challenges this time around, this group overlaps more than my group from this year. Hopefully this will result in me stretching myself enough to make it fun but not enough to feel stressed out. Plus I want to start accepting new review requests by February. But that's a whole 'nother thing altogether. I considered the following challenges but had to let them go for my peace of mind. 1. Witches and witchcraft (hosted by Melissa's Eclectic Bookshelf). This one seemed like it would stretch my reading choices the way that the dystopia challenge did for me this year. Ultimately, I didn't have a ready list of books to choose from and when I had to make some cuts, it had to go. 2. The Eclectic Reading Challenge (hosted by Book'd Out). I participated in this challenge this year and it was relatively easy. Next year it looks like it will be more challenging which really excited me. The new categories mean that I wouldn't complete this challenge in the normal course of my reading. Ultimately, I just had to make some cuts and since I did this one already, I decided to go with something new. 3. 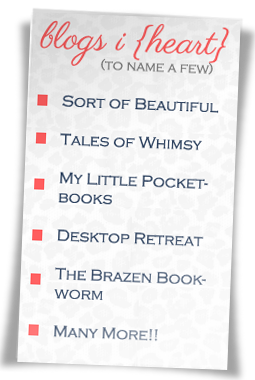 Bookish New Year's Resolutions Challenge (hosted by Butterfly-o-Meter Books). I failed this challenge miserably this year. I had the audacity to include resolutions that were absolutely measurable. Like...reply to comments within 48 hours and reply to review requests within two weeks time. All perfectly reasonable goals that I started to fail around January 2nd. When you pick a challenge like this... there isn't really room for "catching up." Being the person that I am I really can't deal with challenges like this unless I include resolutions that I've already accomplished. I do this in real life but...ehh probably shouldn't lie to myself here. Ah the Sequel challenge, thats a good one. There are a lot of sequels I need to catch up on. And I like the Romantic Suspense one too. I am not a huge fan of Dystopian but I will be interested to see what you read for this one. I will be posting my challenges tomorrow. I'm wondering now if I ever saw your challenges. I'm about to go look now. That's good stuff you've learned. Sounds like me. I don't do challenges anymore but I can definitely imagine audios helping. They helped me since I lived in my car this year. I'm replacing the Eclectic Reader challenge this year with Genre Variety Challenge - let's you select a number of different genres to read. Tanya I just looked at that challenge you posted and I want to join that one too! I am sick and twisted if I sign up for another one. I have 10 now. AARGHH!! But I like this one..... AARGHH! I saw that one. It seems more flexible. I still like the format of the Eclectic Reading challenge though. I failed in 2011 and then succeeded in 2012. You can always adjust the challenges to make them work for you. I do it all the time. I had a 50% success rate on 2012 challenges, and I only entered 4. This year I've signed up for 12. So... we'll see how that goes. :D Good luck! The first year I did them, I signed up for 4 and completed 2 I think. This year I signed up for many more and completed all but one. I've signed up for even more next year (well this one). I think the key is the selection and not the number. Though too many could probably be difficult to manage. LOL!!! Stop making me laugh! I failed in the last three months on my resolutions but thank God most of them were done and fixable in one week. 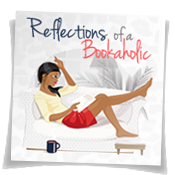 I have been thinking about the Eclectic Reader Challenge but I am over doing it already. Good Luck on your challenges. Thanks! I'm just trying to be real girl. It looks like there are some promising 2013 Dystopian books so you might end up raising your level! And congrats on finishing your GoodReads challenge! I failed my like nobody's business but that's my fault. I had a great time during the Holidays. I might raise my level. Last year I chose the one that required 15 reads. The first 10 were a breeze but that last five... whew. I also don't want to burn out on dystopian. They all look like fun challenges there, I'm sure you'll rock these like you did this year! I'll be looking for your romantic suspense because I've so been wanting to get a little deeper into that genre. I don' know if you've ever read Chassie West's Sunrise series...but it was RS and those books were sooooooo good! Have fun with your challenged and good luck to you in the new year! Hope you and your family are doing great and your brother's recovery is coming along nicely! I haven't. I'm going to look into them for sure. It was one of my favorite genres for some time. Great choices, We actually picked a few of the same ones. :-) I only have 3 though. I have a hard time with challenges so I tried to pick more flexible ones. I saw that! Flexibility can get me in trouble sometimes though. I need structure for my wayward mind. I'm doing just two challenges this year, the Good Reads one (I'm setting my bar at 150 because this year's was 200 and I felt the pressure toward the end of the year) and the TBR pile one. I'm doing the TBR pile one again but I'm starting to view my TBR as futile. We will see. I can feel all your energy jumping out of my screen. You go girl! Lol. I always have fun picking the challenges. Then I forget about them two weeks later. I'd like to do the TBR challenge, but I'm not sure if I fully understand it. Yikes! I am doing the GoodReads challenge though. That seems easy enough. Just read a certain number of books. The idea is that you read books that you already have on your book shelf or your reader. Kind of clearing through the back log. A lot of times I buy books and put them on my shelf and forget about them. It's geared toward that. I only had a Goodreads challenge in 2012, but I failed it. Work just seemed to take over this year and I had less time for reading. I didn't even spend too much time on my blog. Thanks for blogs like yours that kept me sane! ha ha. Ahh you are so sweet! This past year was so crazy for me in so many ways. My blogging suffered though my reading was quite fun. Great challenges. I love the Goodreads challenge too, pretty inspiring. I set it at a 100 this year. I beat that last year but I want to stay encouraged by keeping it at that even number. The Goodreads challenge is the one I care about most, so I try not to put too much pressure on my self when choosing the number. I'd be disappointed if I didn't meet my goal.